Cobb and Co was E\established in Victoria in 1853 by Freeman Cobb and three other Americans. The company soon spread throughout New South Wales and Queensland. Within 15 years Cobb and Co had spread throughout the eastern colonies covering 28,000 miles (44,800 kilometres) per week and using 6,000 horses a day. Horses were changed every 16 miles (25.6 kilometres). The average fare was four pounds for 100 miles. A small coach could carry up to 14 passengers. A large coach carried 82 passengers and was pulled by 12 horses. The average speed was 10 miles per hour. At their peak Cobb and Co had the largest transport system in the world. After Cobb and his partners had made a fortune they sold the business. Bathurst was the centre of operations for more than 50 years.Cobb and Co had branches in all mainland states, New Zealand, South Africa and Japan. 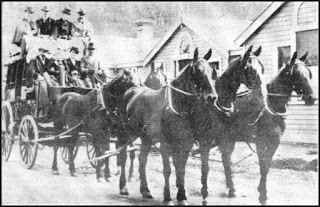 The last Cobb and Co coach ran in Queensland in 1924.